Rhododendron williamsianum, introduced to horticulturists of the western world in 1908 by Ernest "Chinese" Wilson is at once one of the most recognizable and one of the most enchanting rhododendrons. Its unique combination of almost orbicular, mid-green leaves, spreading and somewhat rounded or dome-shaped habit, and disproportionately large, candy-pink, campanulate flowers make it easy to recognize and well-adapted to gardens both large and small. Its densely mounded shape often has a somewhat brooding appearance, a bit like having a very large toadstool in the garden...but its solid presence makes a good anchor to a plant grouping, and can provide an effective screen, if needed. Although never thought of as a large rhododendron, it can in time become quite massive, spreading up and out in large billowy curves that are certainly beyond the reach of vertically-challenged gardeners. It was a species that has so captured the imagination of rhododendron fanciers that a veritable frenzy of hybridizing ensured. After all, there were so many positive characteristics to try to attach to other rhododendrons: small, tidy, glabrous leaves, with lovely bronze new growth, well-shaped, pretty pink blossoms that were large in relation to the leaf size, and a spreading compact habit that keep the blossom down where people could easily admire them. Rothschild in the early 30s, including the iconic hybrid 'Bow Bells'. Lord Aberconway in the late 30s and early 40s, with a whole series of hybrids beginning with "A" ('Adrastia', 'Adrean', 'Amata') as if he were trying to get in first in the Yellow Pages, but also developing the wonderful 'Cowslip', a williamsianum x wardii cross. all the way up to Weldon Delp and Hans Hachman's more recent hybrids. Even J. 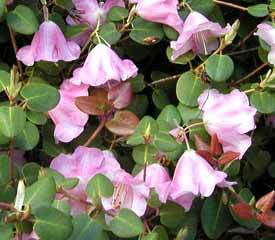 C . Williams of Caerhays Castle used this namesake rhodo in his inspired 'Hummingbird' cross with R. haematodes. R. williamsianum is truly endemic to Sichuan, China, being found only there, and even within that province its distribution is very limited. However, it is now in constant and widespread production and cultivation all over the world.